Coming up on March 3rd the Zimmerman Library Crew will be hosting a Teen Tech Event for middle school students. Teen Tech Week is all about inspiring innovation and creativity in teens and we just love this year’s theme, Libraries are for Making! We are taking over the cafeteria from 3:00-4:15 for one afternoon of makerlicious awesomeness. All middle school students are welcome, just show up and be prepared to have fun! With volunteer help from our Student Library Advisory Board, we’ll have a ton of activities for you. Choose one, choose them all, it’s up to you! Teen Tech Week Bingo: win an iTunes gift card! Feeling tech savvy? Show us your skills! 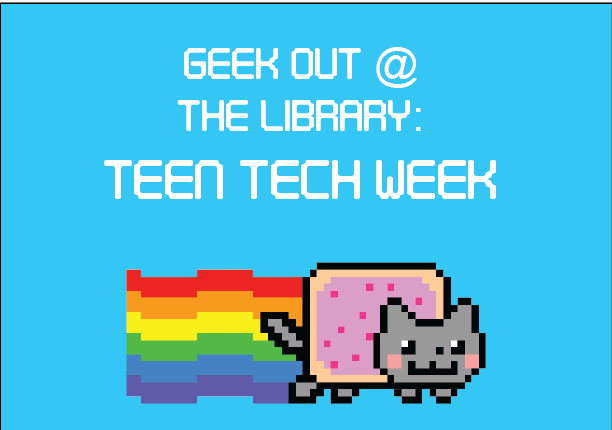 Stop by the library to play Teen Tech Week Bingo. Every entry gets a delicious piece of candy and the winner will receive an iTunes gift card. Use it to buy apps or songs through iTunes. Feeling tech-crafty? Pimp your ear buds at the library craft station. May the tech force be with you all.